Experienced litigation, IT, intellectual property and commercial lawyers collaboratively resolving complex IT disputes. Today’s business disputes frequently involve, directly or indirectly, computer software and information technology. These disputes routinely turn on the performance of computer hardware and/or software, online transactions, traditional proprietary rights (including domain names and trademarks) and emerging rights in data. Understanding the technology in IT and the environments in which it is developed, deployed and exploited can be critical to resolving such disputes successfully. Calfee’s experienced litigation, IT, intellectual property and commercial lawyers assist clients with their IT disputes throughout the mediation, arbitration or litigation process in state or federal courts. 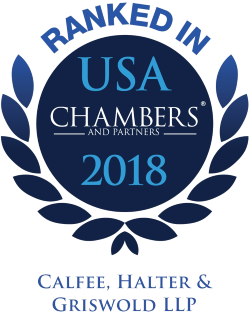 Calfee was selected for inclusion in the 2019 "Best Law Firms" rankings by U.S.News –Best Lawyers in America in several Litigation practice areas. Represented software vendor in construction sector against patent infringement claims, successfully invalidating patent in federal district court and prevailing on appeal in Court of Appeals for the Federal Circuit. Represented public agency in action against software vendor in voting technology arena, resulting in multi-million-dollar settlement. Represented major software vendor in real estate management industry in successfully enforcing rights in software against former licensee. Represented software vendor in clinical trial industry in cross-disputes over proprietary rights in multiple federal district court actions. Represented numerous businesses in connection with software license compliance audits by the Business Software Alliance, Software Information Industry Association and individual vendors (e.g., Microsoft). Representing artist/creator against violation of proprietary rights in content of major video game. Represented developer of MPEG II video codecs in litigation over proprietary rights with multinational telecommunications enterprises; resolved dispute through settlement agreement (including cross‑licenses). Represented public agency in federal court over failure of vendor to meet performance requirements in development and delivery of large, integrated data collection, management and reporting system, involving hardware, software, system design, and integration services. Represented major financial services enterprise in arbitration of dispute over performance and proprietary rights in custom software for processing and tracking consumer financial information. Assisted large online service provider with responses to subpoena seeking information concerning the identity of anonymous posters. Hardware and software performance problems and unsatisfactory online services can be disastrous for both customers and providers. We assist clients with disputes regarding all types of IT products and services, including software development, licensing, implementation, maintenance and support, website design and hosting, IT consulting, ERP system engagements, SaaS/Cloud subscriptions and Application Service Provider relationships. Our dedicated IT litigators bring years of intellectual property experience to disputes involving patent, copyright and trade secret protection for IT assets including hardware, software, business methods, microchips and content, and reflecting the latest developments in the law. We vigorously assert and defend clients’ interests while helping them to achieve business-savvy, cost-effective outcomes. We also have obtained favorable results for trademark-holding clients under both ICANN’s Uniform Domain Name Dispute Resolution Policy and the Anti-cybersquatting Consumer Protection Act. As nearly all forms of commercial activity and underlying processing move to the cloud, Calfee is assisting clients with (and helping them to avoid) disputes in areas such as linking, privacy, defamation, data breach and unsolicited commercial e-mail.